2 x Slazenger Hockey Balls feature a dimple design to help repel water for more consistent play. > Circumference: 23cm. Dependent on the value and weight of the order we might waive this. We always try our very best to solve any problem. Clip allows for hands-free use. We will always help you to have a 100% positive happy buying experience. Output Color Modes: white red green blue. Output Color: White Red Green and Blue. Light Source Quantity: 1. > Floorball. > Surface texture. LESS THAN HALF PRICE! Colour - Yellow. > Lighter than a standard ball. > Set of 12. Leather Hockey Ball Field seem Field Club school training balls grass MATCH. This set of 12 Slazenger Hockey Balls feature a dimple design to help repel water for more consistent play. > 12 balls. Colour: Navy. Rest of the World £14.95. Austria, Germany, Netherlands, Belguim, Greece, Poland, Bulgaria, Hungary, Portugal, Cyprus, Ireland, romania, Czech republic, Italy, Slovakia, Denmark, Latvia, Slovenia, Estonia, Lithuania, Spain, Finland, Luxxemburg, Sweden, France and Malta. 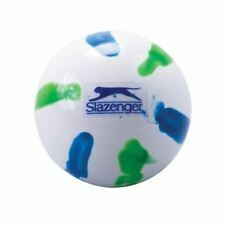 Slazenger Match Dimple Hockey Balls (per 6). The Slazenger Match dimple hockey ball is suitable for hockey players of all levels. Excellent quality match ball. 48 x Quality Lusum dimple training hockey balls and a heavy duty Lusum hockey ball bag. This pack is ideal for any club, coach or school and contains 24 white and 24 orange hockey balls. The balls are durable and suitable for all pitch types whilst the hockey ball bag is capable of holding up to 20 balls and has a drawstring closer and a shoulder strap. The Lusum hockey balls can be used for coaching, training drills and training matches. Pitch markings for full pitch, half pitch & indoor. Dry wipe surfiace. Includes dry wipe marker with eraser to lid. Rest of the World £14.95. Austria, Germany, Netherlands, Belguim, Greece, Poland, Bulgaria, Hungary, Portugal, Cyprus, Ireland, romania, Czech republic, Italy, Slovakia, Denmark, Latvia, Slovenia, Estonia, Lithuania, Spain, Finland, Luxxemburg, Sweden, France and Malta. Impressive cast PVC dimple ball design. Rotationally cast PVC dimple ball. The Kookaburra Dimple Saturn Hockey Ball is a rotationally cast PVC dimple ball that is suitable for club matches as well as school use. Colour: Orange. Rest of the World £14.95. Austria, Germany, Netherlands, Belguim, Greece, Poland, Bulgaria, Hungary, Portugal, Cyprus, Ireland, romania, Czech republic, Italy, Slovakia, Denmark, Latvia, Slovenia, Estonia, Lithuania, Spain, Finland, Luxxemburg, Sweden, France and Malta. Mercian Gold Colour Glitter Hockey Ball. Condition is New. Dispatched with Royal Mail 2nd Class. This is a bright pink Saturn Kookaburra dimple hockey ball. It has never been used but has been stored for a while. It is in excellent unused condition. Pink Glitter Hockey ball from Tk Hockey: a smooth practice ball with glitter design. Hollow construction. Rest of the World £14.95. Austria, Germany, Netherlands, Belguim, Greece, Poland, Bulgaria, Hungary, Portugal, Cyprus, Ireland, romania, Czech republic, Italy, Slovakia, Denmark, Latvia, Slovenia, Estonia, Lithuania, Spain, Finland, Luxxemburg, Sweden, France and Malta. 6.95 NEW kookaburra SATURN super dimple hockey ball FULL SIZE 4 colours. choose a ball . Colourway: Rainbow. Quality PVC ball with cork core. Quality PVC Hockey ball. Ball has a cork core. Includes bag with extra storage and shoulder strap, and 2 hockey balls. Grays Astrotec Hockey Ball. Astrotec Hockey Ball from Grays Hockey a rotationally moulded ball with durable dimpled pattern PVC cover. Ideal for top level use on synthetic pitches. Weight: 5. Rest of the World £14.95. This ONeills Smart Touch Hockey Ball is designed with smart touch technologies and can help improve your agility and skills whilst playing. Hockey ball. Smart touch.